I've been reading the nihonken forum for quite a while now, but had yet to post. Ever since I've started getting interested in the japanese breeds after a coworker presented me to his shiba inu, I've looked for more information about the past and the temperaments of the nihonken. The idea of finally adopting one is coming to fruition, and I am hugely biased towards the akita inu. I have done extensive research regarding this breed, but two opposites reside in me. This dog seems ideal temperament-wise, but I'm a fairly active person. I often read that the akita is somehow lazy, and I am constantly questioning myself in relation to what I'd expect from him. I've also read that the dog adapts well to his master. To give you a bit of insight about my level of activity, my weekly routine consists of 45min running on tuesdays and thursdays, 1hr30-2hrs on saturdays and doing mountain bike between 2 to 4 hrs on sundays. It's never too intense, and it is rather to keep myself in good shape and to bathe in nature. On rares occasions I'll go hiking/biking for more than 4hrs. Is it illusory to think an akita would follow me during my activities ? I have met plenty of akitas, and their level of activity tends to vary depending on the owner. The different topics similar to my case have been very informative, but I feel they do not completely relate to my profile. Other races have also pulled my attention, but I indubitably get back to the akita. Your feeling and experiences, especially regarding activity level, would be very helpful. Thank you very much ! While there are owners who can drop in a photo here showing their akita inu beside a stream in the mountains and be able to truthfully tell you that the dog enjoyed the walk, akitas on this forum enjoy adventure only occasionally, not with regularity, and none of them go out for that many hours. Whereas you will easily find owners of Kishu and Kai that hike, hunt and scramble multiple times a week; any of the other 5 Nihon Ken would be a better choice for a regular active lifestyle. Brad had 4 akita from europe that he intended to hike with but none of them worked out for that activity. The breed also tends to have less-than-excellent hip structure. Talk with akita breeders about the hip scores of the dogs they breed- it is hard to find two dogs to breed with OFA "good" or better hips. So even if you find one in which the spirit is willing to do robust exercise several times a week, it may be unfair to ask them to jog/bike strenuously for their long term health. If you search long and well, you may find parent dogs with durable structure and an eager manner to give you the best odds in a pup that will enjoy and hold up to all that you want to enjoy together. But more likely you will be able to enjoy your akita inu the most after your run, and doing all the other things you do besides biking, running. I also know from akita owners that there is something about them in which only an akita inu will do, and that getting a different dog can leave you still longing for an akita, so I am not at all saying "Don't get an akita, get a Kishu" I am saying, get the akita you admire, find the most likely one by doing lots of research, and have fair expectations for her and don't try to make her something she isn't. Running/biking is only a short part of the day :) the other 22 hours, you will have a terrific companion! Either way, I hope you find the companion you're looking for! I own American Akitas. My experience has been they are great out the gate but not much for stamina. Especially in the summer. Their coats make them fairly heat intolerance. They can overheat fairly quickly. In the winter they can go longer, especially in the snow. Never have I seen a dog that enjoys the snow more. Structurally I agree I don't think they would be able to keep up with you and all your activities. But I do understand why you would want one. I held out for a year to get my first. My husband was somewhat leery of the breed. I have a good chunk of puppy owners who do multiple-hour hikes with their dogs. I know people in our breed clubs who do 40-90 minute bike rides, sometimes in wooded areas, with their dogs. I agree with @WrylyBrindle's writeup for the most part. Akitas are not as constantly active as, say, a husky. But they do a very good job at matching activity levels with their owners. If you hike regularly and that is part of the dog's routine they will generally be good at it and enjoy it. If you are sedentary and hike only rarely, then they will not have the stamina for it. Like any physical activity, you have to build up to it. And they're not going to run around and exercise on their own without the mutual company of their owner/family to make it fun. ETA x2: Environment / weather plays a big role. As @dachiboy mentioned heavy exercise in high heat or humidity will tire them out faster. One of my pups pretty much refused to do much of anything when he lived in Alabama, but now that his family moved to Colorado he's very active. @WrylyBrindle : you're right in that I've always run on my own, and missing on the akita for this very reason might make longing for one even more. And even if I were to run with him, I'd need to wait for 2 years for the puppy to grow anyway (I could think about adding a more sporty nihonken at this point). By the way, reading this forum has really helped me asking the good questions to breeders, and the akita inu is quite popular in France so I have always made sure to ask about the many lines and the health of the dogs. Some breeders had indeed dogs more active than others. @Crispy : Regarding my activities, I feel like what I write tells more than I really do. I am a kinda slow runner, and I have always wondered if the slow-pace of the akita wouldn't suit me and suit him. By 'set-their-own-pace adventures', do you mean it is hard to make them focus ? @dachiboy : I can totally relate to overheating. I absolutely hate summer, and spend as much time swimming as I can during this season. @PoetikDragon : I had read about your posts regarding the activity level of the akita, and this is partly what led me to wonder if the dog could follow me. I'm a regular runner, so I think I could make it a routine for my dog. I'd probably have to reconsider long biking sessions, but as long as the dog is with me, that would be a perfect outing as you said. Any dog can be more active than average if conditioned properly, although that would require consistently giving them lots of activity. If your plan is to be relatively inactive most of the time with the occasional longer hike, then an akita may not be the best hiking companion. One of the nice things about the medium NK is that they are ready to go on adventures any time, but are highly adaptable to their owners and are calm within the home. My Kai and Shikoku are always ready to go, but they never bother me if my schedule doesn't permit me to take them out for a while. I'm not going to tell you not to get an akita, either. If an akita is the dog you really, really want, then you should have one! But it may end up being that your akita can only comfortably accompany you on shorter hikes. Exercise by bicycle or motorized scooter is the primary way that the Japanese (and some Asian Americans) condition their Japanese Akitas for show. The judge talked about it a little at our most recent seminar, but it has been mentioned at almost every AKIHO or NIPPO judge seminar I've been to at least in passing. Judges complained that many dogs in the US are not in top condition because of lack of exercise, and strongly recommended bike or pulling exercises daily. At our recent seminar the judge said to begin doing brisk paced walks at 3 months and running with a bike at 8-10 months. [Best guess this translates to about 4 mph and 10 mph respectively.] A Japanese breeder I have spoken to a lot had similar schedule. For puppies he recommended 20 minutes brisk walk twice a day. For dogs 10 months and older, he recommended 40 minutes brisk walk once a day and 20 minutes bike ride at 15 kph [9 mph] once a day. Another breeder in the US just does 40 minutes bike ride once a day. Tae Kim on this forum has used scooters with his dogs, but I don't know at what speed or duration per day. Of course, know your dog's limits, be safe, and consult a vet if you have any concerns. But my general thought is this: I let a puppy run as much as it wants to and never force it. They will limit themselves on their own. Forcing is always unhealthy, but I think that its not healthy to restrict a dog's activity and treat it like a fragile glass bauble, either. Appropriate exercise is really important for growing dogs and making tight, strong joints held together by good muscles and ligaments. Not allowing a dog to run until it is two years old is asking for an injury IMO. And if you wait until a dog is fully done growing before exercising those muscles, you may never get the full potential of fitness and stamina the dog could have had. Appropriate exercise makes for tighter hips and less risk of dysplasia, too. ETA: When someone mentions not letting a dog run until two years old, I think, what if we didn't let human kids exercise until they were 24 years old? How would that affect their overall fitness and health? It wouldn't be good, that's for sure. I haven't biked with an Akita, but I bike my dogs and it is indeed very good conditioning. 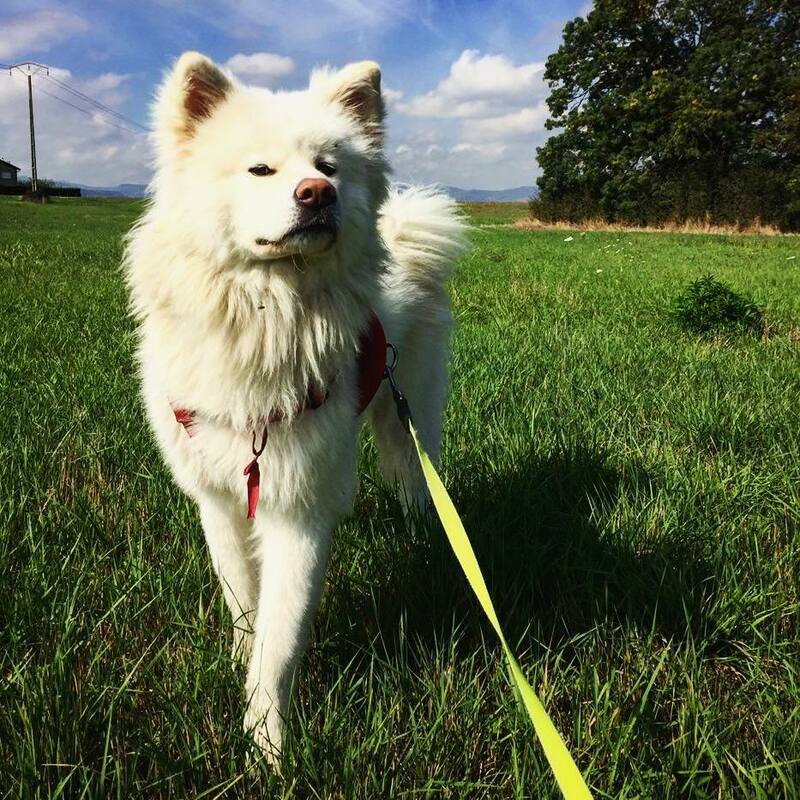 You may be interested in Hokkaido...they have some similar appealing behavior traits as Akita (devoted, really really love their people), but are much more active, very hardy and ready to go and do at any time. I agree a medium breed may be a better fit for your current exercise level. @Heidi : I understand that in the end, it's similar to how we build up stamina. The threshold for an akita might be lower than another breed, but it is quite possible to run with him as long as limits are defined by both the dog and the master. I have considered medium-sized NK and still plan to discover more about the shikoku and the kai ken. Two akita breeders I'm going to visit also breed either shikoku or kai so that will be an opportunity to learn more. @PoetikDragon : That is very interesting to know. I knew that the japanese had a different way of doing things hence the particular temperament of the breed. Do they condition their akitas only for shows or is it more of a long-term conditioning and regular exercise ? I had read about letting the puppy grow before engaging him in more strenuous physical activity, and that he should "set" the pace before that. @Teno They do that exercise regularly and always keep their dogs in condition. Read "bubble puppies don't build bone" in particular. This one again stresses letting the puppy tell you when it is "done" and not over-exercising. Also that consistent regular exercise is important to build strength and avoid injuries. My thoughts on this is that the akita will enjoy it if you make sure it's fun from the beginning. When I tell my akita what a "good boy" he is, he will turn his ears back towards me and run even faster, like "of course I'm a good boy, look at me go!". Akitas are known to be difficult in their "teens", but I think that much of that difficulty is due to them being understimulated and bored. Akitas don't necessarily need much brain-stimuli, but they need to use their bodies to get out all that energy. I'm not super active, but the last few months we've been skijoring 2-3 times a week, for 1.5 hours at a time. The akita LOVES it and I think it's because he knows that I love it, and we're both having fun. We also go for the occasional jog. My jogging speed is his trotting speed, so it's a good match there. He doesn't pull when jogging, but prefers running beside me. Also how intense the training can be really depends on where you live. They have a really thick double coat, which is perfect for mountains and tempered-/cold sones, but hard work during warm summer days can be hard on them no matter where you are. @PoetikDragon : I was looking for such charts and guides about puppies' growth, thank you ! @paranoidparrot : thanks for you input ! That is good to know. Did you choose your akita based on his activity level, or is it solely based on building up his stamina ? I have noticed that some of the LA AKIHO dogs (via pictures from shows) don't look as conditioned as the dogs do in Japan. I attributed this to the weather and diet. But now I realize that exercise has much to do with it too. I've been exercising with my dog since he was a puppy. He is 3 years old now and gets an hour of walks/or jogging a day. We also do 1-2 hours of off leash running and this winter, we started to get him to pull a light sled with my 1 year old in it. He LOVED it! My dog can pull like there's no tomorrow, we got him a pulling harness (he usually can pull me off my feet) and I am sure this has gone to develop his chest. Anyway, I am very please with his structure and posture and I think it had a lot to do with his exercise and diet. @MapleTwinkie : That's very interesting to read. Did you have your dog follow a specific diet, and if so, what was it ? Would you have any recommendations ? @Teno , my dog eats a high protein raw diet. Chicken bones, unprocessed tripe, organ meats, bison, game mixes, etc. For my dog, feeding raw has worked out well for him. He used to have all kinds of allergies and would bite the fur off his legs. We spent hundreds of dollars on vet bills and specialist vets ( and on blood tests, medications etc ) and the only thing that stopped his itching was getting him off kibble. My breeder, Mr. Shirai, feeds his dogs nothing but kibble and they all look fantastic. He specifically told me not to feed him anything but kibble. I held on to that for as long as I could...and tried raw because it was the last resort. I was that person who always said "there's no way i'm feeding raw...". But this has been the best decision I ever made for him. Mr. Shirai did tell us to exercise the dog regularly with both endurance and pulling exercises. He didn't believe in teaching a dog to "walk beside" its owner. An Akita is a very strong willed dog and likes to lead. Saigo pulls on my walks all the time and I let him. *shrug*. He's strong enough where I use my body weigh to lean against the leash to get him to move. When we go off leash, we work on his recall which is 95% when no other dogs are around. When other dogs are around, it's 0% lol. Thank you @MapleTwinkie, I did not know about Mr Shirai, and it is interesting to discover him. I'll take note of your experience. Besides, I'm very interested in the way you have trained your dog. When exercising him, is he enjoying the whole training session or is there a time you feel he's clearly bored and won't move if you stop ? By the way, when you mention off leash and encountering dogs, is it in a predictable environment where you expect to meet dogs or is it in the middle of the forest and it's a surprise to both of you ? I got a long coat JA from a breeder in SoCal, my Kagome, she is the perfect dog, she's sets the standard. Kagome grew up with a shikoku (Inu) on 3 acres in Washington state. When out in the yard she was active for about 10-15 minutes, playing fetch or chase with Inu, eating plants she would later throw up, sniffing around, chasing neighbor cats off her yard, then she would get bored and lay out on the deck. When I wasn't looking she would wander over to the neighbor’s yard. We had our walks, but she wasn’t what you would consider active by any means. We would take Inu for runs, but not Kagome and her heavy coat. Then I moved to West Chicagoland and a small apartment with no yard. I had to be proactive in making sure they had plenty of exercise. An exercised dog is a happy dog. I didn’t want to take Inu out and leave Kagome behind. So together we went from 0 miles to 10 miles. We started out slow, running/walking, running 3 miles, 5 miles, 7 miles and eventually 10 miles together. We ran sidewalks and trails. Both Inu and Kagome were trained to walk on leash without pulling so it translated well over to running. It took practice but they both caught on, Inu on one side, Kagome on the other. Kagome will not pull hard but she likes to keep the lead tight, she likes to be ahead of everyone. For dogs that grew up country, they adjusted well to seeing lots of people, bikers and other dogs. I am not fast at all, we do a 9 minute mile, so our ten milers are a 90min+ excursion. We run in sun, snow, rain, winter and summer. I throw in interval sprints during our runs to mix it up. In the winter the dogs love the snow and crispy air, if the snow is not packed enough or too deep for running, I get my snowshoes out. I use a harness around my hips to keep my hands free. Sometimes the dogs pull a little if they see deer, skunk or rabbit, but nothing too crazy. We do a lot of night time running as well. Sometimes on the trails I let Kagome off leash, she loves to run ahead a little, her recall is good only if there isn’t another animal or person to peak her interest. I do have her coat shaved down in the spring, otherwise she would have a heatstroke. “Humanity over vanity.” It gets pretty short, but not short enough for sunburn. It grows back in time for winter weather. She is like a puppy when the coat comes off, like a huge weight has been lifted off her shoulders. I worried about over working them cause we would average 45-50 miles a week in peak season, but one day after a 10 miler, we came home and they started horse playing around, I’m thinking “you guys just ran ten miles, you should be exhausted,” but no they were still goofing off. In the summer it gets hot in the city, so we do early morning/late night runs. I have always been afraid of biking with them cause if they both pulled me off balance, that could be one hot mess. I believe them to be much happier now than when we lived in the country, no yard has forced me to put more importance on their exercise. It is hard to take them on walks now, because they would prefer to run. I really believe dogs were meant to run. It seems your heart is set on the Akita, I say go for it. Place a huge emphasis on healthy parents with healthy joints. Kagome is perfection, except when she pees in my bed…. I really loved reading your post @scoobylicious, thank you very much ! Since my original post, I have continued visiting breeders across France, and most of them concurred on the fact that the akita, though not bred for sports, likes doing what his/her master is doing. Those who had the healthiest akita (after seeing their health tests and their temperament) were regularly exercising them on running-sessions. Do you think your shikoku influences your akita by the way ? At this point, I'm set on choosing an akita inu, and only need to find the suitable breeder and parents. I'm glad I took the time to think this over and especially meet as many breeders as I could, even if I had to travel some distance. It is really eye-opening and meeting them in person allows you to really discover the variety of temperaments and the breeding process. I think the nihon ken should come in the next few months, so I'll post pictures ! Nothing major, Kagome has a pretty defined personality. Looking forward to puppy pics! At home, my JA is like a big house cat. She gets the zoomies in the morning and at other random times. Once she gets her crazies out, she's pretty calm. She goes for bike-rides with me in the cooler months and does fine, but we aren't out doing marathons or anything. She is a suburb/city dog, lol. We go to dog-friendly bars and she's content to sit or lay down. Hi everyone, a quick update to share with you that I got Soma a year and a half ago. He's now a 1.5 years old, white long-hair akita inu. Sorry for not posting, I'll update with tons of pictures very soon. Researching and visiting breeders (all over France) has paid off, as I've got a fantastic dog from one of the best breeders, with countless hours training and educating him. The results are a great and balanced companion. He's very akita inu in some ways (stubborn when he wants, stunning, extremely strong prey drive) and not so much in others (he's so friendly that he literally attracts masses of people, he runs a lot, he obeys quite well). Here's a quick pic I made while it was still sunny where I live.